With Our Cinsey Silicone Coated fireproof waterproof safe document bag, you can give your important documents, cash, jewelry and other valuables a second layer of protection in the event of a fire. ✔ Heat and fire resistant: Our fire resistant pouch has ability to resist heat and fire up to 20 minutes at a temperature of F°1100. Besides it's also highly water resistant just in case it gets wet for any reason. ✔ Safe to use: Non-irritating high quality silicone coated fiberglass outside and soft fabric inside will leave no splinters and causes no damage or itch to your skin. ✔ Large capacity, nice exterior and no space occupation：15"x11" -It's a great size as you don't have to fold your basic papers to fit and it holds papers, cash and small jewelry well. It fits nice in your little safe as well so it's an extra step of protection but also helps you organize the safe better. Once you bought or decided to purchase product from Cinsey, you deserve a better service and enioy the best purchasing experience. If you have any question or problem, welcome to contact us, we're here to help you then must provide a satisfactory solution! 【 FIRE AND WATER PROOF DOCUMENT BAG】Double Layered design, silicone coating, this safety bag is WATER-RESISTANT use in case it gets wet for any reason.The outside material can withstand high temperature of 1200℉, the inside one also can withstand up to 1000°F for protecting your important personal documents. You can feel 100% confident that your important information is in a safe place. 【DOUBLE PROTECT CLOSURE & MULTIFUNCTIONAL FIREPROOF DOCUMENT BAG】The heavy duty hook & loop is used to close the bag and will be a little tough to open,but it definitely stops it from coming open inadvertently. It would seal the documents really well and most degrees to keep our things won't be fall off. 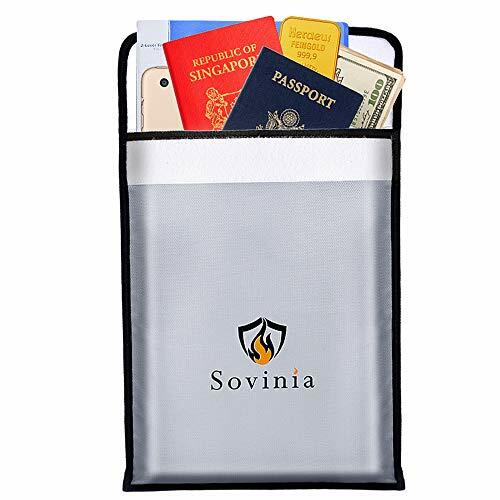 Perfect for storing multiple batteries, cash, birth certificate, passport, jewelry, social security cards, care titles, important documents and so much more. 【LARGE SIZE & LESS SPACE OCCUPIED】Perfect 15"x11" size that designed to take up minimal space and offer you ample storing space, can easily hold your documents without wrinkling/crumpling them and fit anywhere. And the fire resistant document bag also lies flat, allowing you to easily conceal it in your home. With the thick and very sturdy safe fireproof waterproof bag, your documents won't be fold or crinkle once you set them nicely in it. 【SIMPLE TO USE & PERFECT GIFT CHOICE】 Simply slip them inside, seal the Velcro closure, and place flat-side down to ensure total safety and security. This fire document bag must be the perfect gift for a friend who is married. It doesn't take up much space and will be a perfect place for whom to store her wedding certificate. If you have any questions about this product by cinsey, contact us by completing and submitting the form below. If you are looking for a specif part number, please include it with your message.